Q. When I look at some of the pictures I see people in different color (Red, light blue, yellow as well as dark blue) hats. Is that a mistake? A. 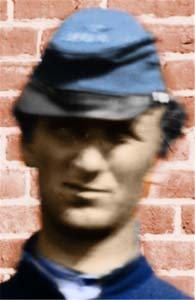 The hat color (as well as rank insignia was color coded depending on job description. The colors was the same for both North and South. Artillery wore red, Cavalry wore yellow, infantry was light blue and general officers (and their staff) wore dark blue (union) or gray, (confederate). Sometimes it is hard to make a decision as to what the color should be. Generals and their staff always wore dark blue, but the others is a little bit of luck and detective work. For example, in the image of “Custer with Confederate prisoner” you can see that Lt. Washington is wearing a Yellow cap. On the ground behind him you see what appears to be a cap. Since we know that this was a classmate of Custer’s we did a little history game play. Perhaps the cap on the ground was Lt. Washington’s confederate cap and that Custer gave him his cavalry cap to wear for the picture. Obviously there is no way to know so each picture is a guess and some speculation as to what should be right. The “traditional” dark blue cap (or Kepi) was worn by all general officers and their staff. Unless enlisted ranks were part of the staff they most likely would have worn another color cap. The Navy work very similar uniforms, but all of them were “Navy blue” and did not have the color breakdown the Army had. The light blue of the Infantry would probably have been the most common. 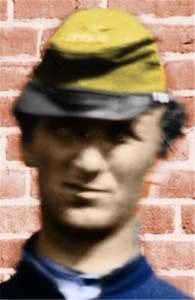 Along with the cap, the shoulder insignia of the officers and the sleeve insignia of the enlisted men were in this color. Artillery units wore dark red caps (perhaps this was to indicate that they were involved with explosives). In a similar way that in the modern Navy red jerseys are worn by those involved with ordnance and munitions aboard Aircraft Carriers. Cavalry wore yellow caps. This is the color cap that Custer would have worn prior to his promotion to General in 1863. If you look at the “Flying Artillery” image you will notice that even though all of the men are on horseback, they were not cavalry, but Artillery. Hence no yellow caps. Other hats were also acceptable, “slouch hats” were a more traditional brimmed hat was common on both sides, typically brown these were preferred since they provided better protection from the sun than the Kepi. More western style hats were also common. Custer can be seen in the studio image wearing a more dashing hat. In the picture of the “Grant’s Council of War” notice the most number of hat styles, Kepi’s, Western, Slouch as well as two Zouave (red “fez” like hat near left wagon). 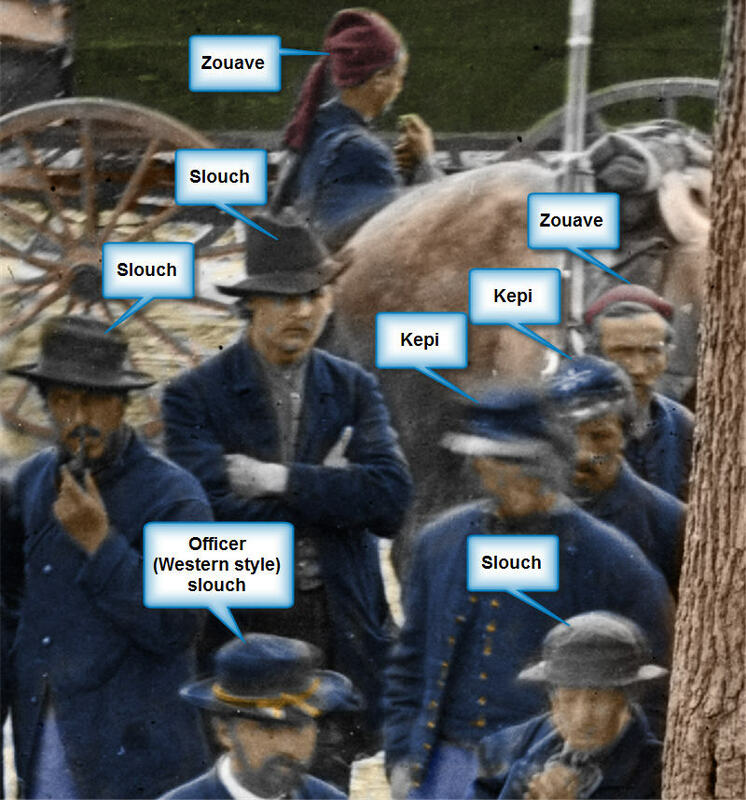 Below is an enlarged section of “Council of War” showing many “approved” hat styles used during the war.